For other people with the same name, see Edward Reed (disambiguation). Reed was born in St. Rose, St. Charles Parish, Louisiana on September 11, 1978. He attended Destrehan High School in Destrehan, Louisiana. With the Fighting Wildcats football team, he was an all-state selection at defensive back and as a kick returner and also the New Orleans Times-Picayune District Most Valuable Defensive Player. Reed totaled 83 tackles, seven interceptions, three forced fumbles and 12 passes deflected in his senior year while also seeing action at running back and quarterback. He also returned three punts for touchdowns. Reed's jersey number 20 was retired by the football team. Reed also played basketball, baseball, and track & field. In addition to football, Reed was a standout track athlete at Destrehan High School. He was a member of the state champion 4 × 100 meters relay squad. He set a high school record throw of 56.94 meters in the javelin throw. Also a standout long jumper, he recorded a personal-best leap of 7.20 meters. While in college, Reed joined the Miami Hurricanes track and field team in 2000, where he competed as a jumper and javelin thrower. He placed 7th in the triple jump at the 2000 Big East Championships, setting a career-best jump of 14.58 meters. In addition, he finished 3rd in the javelin throw, with a personal-best throw of 60.08 meters. Reed received an athletic scholarship to attend the University of Miami, where he was a standout defensive back for coach Butch Davis and coach Larry Coker's Miami Hurricanes football teams from 1997 to 2001. Reed was a member of the Hurricane's 2001 National Championship team. After redshirting in the 1997 season, Reed led the team with two interceptions and four forced fumbles in the 1998 season. He had two more interceptions in the 1999 season. Reed was recognized as a consensus first-team All-American in the 2000 season, and a unanimous first-team All-American in the 2001 season. In 2001, he led the nation with nine interceptions for 209 yards, which was a school record, and three touchdowns. He helped seal a memorable win over Boston College in 2001 when he grabbed the ball out of teammate Matt Walters's hands, who had just intercepted it, and raced 80 yards for a touchdown. Reed was honored as the Big East Defensive Player of the Year in 2001, and was named National Defensive Player of the Year by Football News. He was a finalist for the Jim Thorpe Award and was a semifinalists for the Bronko Nagurski Trophy. Reed set several records during his time at the University of Miami. He holds the record for career interceptions with 21, career interception return yards with 389, and interceptions returned for touchdowns with five. He also blocked four punts during his four-year career. In addition, he was a member of the track and field team during his years at Miami and was a Big East champion in the javelin. Reed and Indianapolis Colts wide receiver Reggie Wayne were roommates during their time at the University of Miami. He graduated in 2001 with a bachelor's degree in liberal arts. Reed was inducted into the University of Miami Sports Hall of Fame as part of its Class of 2012 at a banquet held in Miami on March 29, 2012. Reed was inducted into the College Football Hall of Fame on January 7, 2018. The Baltimore Ravens selected Reed in the first round (24th overall) of the 2002 NFL Draft. Reed was the second safety drafted, after Oklahoma's Roy Williams was selected eighth overall by the Dallas Cowboys. On August 3, 2002, the Baltimore Ravens signed Reed to a five-year, $6.18 million contract. Reed (20), Ray Lewis, and Chris McAlister playing for the Ravens against Chris Henry of the Cincinnati Bengals in 2006. Reed entered training camp slated as the starting free safety after the role was left vacant due to the departures of Rod Woodson and Corey Harris. Head coach Brian Billick named Reed the starting free safety to begin the regular season, alongside strong safety and fellow rookie Will Demps. Demps was replaced by Anthony Mitchell for the first two games while recovering from an elbow injury. He made his professional regular season debut and first career start in the Baltimore Ravens' season-opener at the Carolina Panthers and recorded three solo tackles in their 10–7 loss. On September 30, 2002, Reed recorded four solo tackles, a pass deflection, blocked a kick, and made his first career interception during a 34–28 win against the Denver Broncos in Week 4. Reed made his first career interception off a pass attempt by Broncos' quarterback Brian Griese and blocked a punt by Tom Rouen in the second quarter to set up a 13-yard drive for a touchdown. The following week, he made three solo tackles, a season-high four pass deflections, and intercepted a pass off of Browns' quarterback Tim Couch during a 26–21 win at the Cleveland Browns in Week 5. In Week 6, Reed recorded three solo tackles and made his first career sack on quarterback Peyton Manning during the Ravens' 22–20 loss at the Indianapolis Colts. The following week, he collected a season-high seven solo tackles as the Ravens defeated the Jacksonville Jaguars 17–10. On November 10, 2002, Reed recorded five solo tackles, two pass deflections, and made a season-high two interceptions off passes by Bengals' quarterback Jon Kitna in the Ravens' 38–27 victory against the Cincinnati Bengals in Week 10. Reed made his first interception of the game in the second quarter and was returning it for a touchdown when Bengals' wide receiver T. J. Houshmandzadeh forced him to fumble the ball by hitting his arm as Reed was extending the ball in celebration. His fumble bounced into the endzone and was eventually recovered by Bengals' wide receiver Peter Warrick for a touchback. He started in all 16 games as a rookie in 2002 and made a career-high 85 combined tackles (71 solo), 12 pass deflections, five interceptions and one sack. He was named to the NFL All-Rookie Team. Reed and Will Demps were retained as the starting safeties during the 2003 season. Reed started in the Baltimore Ravens' season-opener at the Pittsburgh Steelers and collected a season-high ten combined tackles (seven solo) and a pass deflection in their 34–14 loss. The following week, he collected three solo tackles, a season-high three pass deflections, a season-high two interceptions, and scored his first career touchdown during a 33–13 victory against the Cleveland Browns in Week 2. He intercepted a pass by Kelly Holcomb in the second quarter and returned it for a 54-yard touchdown. On October 12, 2003, he recorded six combined tackles, deflected a pass, made an interception, and blocked a punt before returning it for a touchdown during a 26–18 victory at the Arizona Cardinals in Week 6. Reed blocked a punt by Scott Player, recovered it, and then returned it for a 22-yard touchdown in the second quarter. In Week 12, he made seven combined tackles and returned a blocked punt by Tom Rouen for a 16-yard touchdown during a 44–41 win against the Seattle Seahawks. Reed was selected to the 2004 Pro Bowl, marking the first Pro Bowl selection of his career. He started in all 16 games in 2003 and recorded 71 combined tackles (59 solo), 16 pass deflections, seven interceptions, three touchdowns, and a sack. The Baltimore Ravens finished first in the AFC North with a 10–6 record and earned a playoff berth. On January 3, 2004, Reed started in his first career playoff game and finished the Ravens' 20–17 loss to the Tennessee Titans in the Wild Card Round with one pass deflection and an interception. Defensive coordinator Mike Nolan retained Reed and Will Demps as the starting safeties in 2004. On September 26, 2004, Reed recorded three combined tackles, a season-high three pass deflections, and intercepted two passes by Bengals' quarterback Carson Palmer during a 23–9 win at the Cincinnati Bengals in Week 3. In Week 9, Reed recorded three combined tackles, deflected a pass, and returned an interception by quarterback Jeff Garcia for a 106-yard touchdown as the Ravens defeated the Cleveland Browns 27–13. In Week 12, he collected a season-high nine combined tackles and broke up a pass during a 24–3 loss at the New England Patriots. On December 23, 2004, it was announced that Reed was selected to play in the 2005 Pro Bowl. He started in all 16 games and recorded 76 combined tackles (62 solo), eight pass deflections, a career-high nine interceptions, three forced fumbles, and two sacks. Reed was named as a First Team All-Pro for the first time. He was named the NFL Defensive Player of the Year by the Associated Press. In addition, Reed set an NFL mark for most interception return yardage in a season, accumulating 358 return yards on nine interceptions; Reed held this record until 2009, when it was exceeded by Darren Sharper. He also returned an interception 106 yards for a touchdown, which was an NFL record until Reed reclaimed the record in 2008. The Baltimore Ravens promoted defensive line coach Rex Ryan to defensive coordinator after Mike Nolan accepted the head coaching position with the San Francisco 49ers. Ryan opted to retain Reed and Will Demps as the starting safeties for the fourth consecutive season. On October 16, 2005, Reed collected a season-high six combined tackles during a 16–3 win against the Cleveland Browns in Week 6. Reed was inactive for the next six games (Weeks 7–12) due to an ankle injury. He finished the 2005 season with 37 combined tackles (33 solo), nine passes defensed, and an interception in ten games and ten starts. On June 27, 2006, the Baltimore Ravens signed Reed to a six-year, $40 million contract extension that includes a $15 million signing bonus. Reed with the Ravens in 2008. In Week 4, Reed collected a season-high seven combined tackles, broke up a pass, and recorded his first career safety during a 16–13 win against the San Diego Chargers. On November 5, 2006, Reed made three combined tackles and scored a touchdown in the Ravens' 26–20 victory against the Cincinnati Bengals in Week 9. Reed scored a touchdown after teammate Samari Rolle intercepted a pass by Carson Palmer, that was intended for Chad Johnson, and returned it 24-yards before handing it off to Reed who returned it for the remaining 24-yards for a touchdown. On December 10, 2006, he recorded three combined tackles, made a season-high three pass deflections, and intercepted two passes by Chiefs' quarterback Trent Green during a 20–10 win at the Kansas City Chiefs in Week 12. On December 20, 2006, Reed was named to the 2007 Pro Bowl. He started in all 16 games in 2006 and recorded 59 combined tackles (51 solo), nine pass deflections, five interceptions, a forced fumble, and a touchdown. Head coach Brian Billick named Reed the starting free safety to begin the regular season in 2007, alongside strong safety Dawan Landry. He started in the Baltimore Ravens' season-opener at the Cincinnati Bengals and made one tackle, deflected a pass, and had his first career punt return for a touchdown in their 27–20 loss. Reed returned a punt by Kyle Larson in the fourth quarter and returned it, untouched, for a 63-yard touchdown to put the Ravens' ahead 20–19. On October 14, 2007, he recorded three combined tackles, deflected a pass, and made an interception during a 23–3 win against the St. Louis Rams in Week 6. On December 18, 2007, it was announced that Reed was selected to play in the 2008 Pro Bowl. On December 31, 2007, the Baltimore Ravens fired head coach Brian Billick after they finished with a 5–11 record in 2007. He started in all 16 games in 2007 and recorded 39 combined tackles (29 solo), 13 pass deflections, and seven interceptions. Reed also served as a backup punt returner in 2007 and finished the season with ten punt returns for 94-yards and one touchdown. In the 2008 Pro Bowl, he recorded two interceptions, tying the Pro Bowl record. Head coach John Harbaugh retained Reed and Dawan Landry as the starting safeties in 2008. On September 21, 2008, Reed recorded two combined tackles, broke up two passes, and returned an interception for a 32-yard touchdown during a 28–10 win against the Cleveland Browns in Week 3. On November 23, 2008, Reed made two combined tackles, a season-high four pass deflections, intercepted two passes, and returned an interception for a 107-yard touchdown during a 36–7 victory against the Philadelphia Eagles in Week 12. Reed first interception of the game came in the first quarter off a pass by Donovan McNabb which led to McNabb's eventually benching. He made a second interception off a pass by quarterback Kevin Kolb and returned it for an NFL record 107-yard gain. The previous record was also held by Reed and was a 106-yard interception return in 2004. The ball he intercepted and the jersey he wore during the play are now displayed in the NFL Hall of Fame. In Week 15, he collected a season-high eight combined tackles and had a sack on quarterback Ben Roethlisberger during a 13–9 loss to the Pittsburgh Steelers. On December 16, 2008, Reed was announced as a part of the 2009 Pro Bowl roster. The following week, he made one tackle, two pass deflections, and intercepted two passes by quarterback Tony Romo in the Ravens' 33–24 win at the Dallas Cowboys in Week 16. In Week 17, Reed recorded three solo tackles, broke up two passes, and intercepted two pass attempts by David Garrard in Baltimore's 27–7 victory against the Jacksonville Jaguars. His performance marked his fourth game of the season with two interceptions. Reed started all 16 games in 2008 and recorded 41 combined tackles (34 solo), 16 pass deflections, tied his career-high of nine interceptions, two touchdowns, a sack, and a forced fumble. The Baltimore Ravens finished the 2008 season second in the AFC North with an 11–5 record and earned a playoff berth. On January 4, 2009, Reed had one tackle, broke up two passes, made two interceptions, and returned one for a touchdown during the Ravens' 27–9 win at the Miami Dolphins in the AFC Wild Card Game. Both interceptions came off pass attempts by quarterback Chad Pennington. The Baltimore Ravens reached the AFC Championship, but were defeated by the Pittsburgh Steelers who went on to win Super Bowl XLIII. Reed recorded two solo tackles and deflected a pass as the Ravens lost 23–14. On January 26, 2009, Baltimore Ravens' head coach John Harbaugh promoted linebackers coach Greg Mattison to defensive coordinator after Rex Ryan accepted the head coaching position with the New York Jets. Mattison opted to retain Reed and Dawan Landry as the starting safety duo in 2009. In Week 5, Reed recorded a season-high six solo tackles, deflected a pass, and returned an interception for a touchdown during the Ravens' 17–14 loss to the Cincinnati Bengals. Reed intercepted a pass attempt by quarterback Carson Palmer, that was intended for wide receiver Chad Ochocinco, and returned it for a 42-yard touchdown in the second quarter. Reed sustained a groin injury and was inactive for four games (Weeks 13-16). On December 29, 2009, it was announced that Reed was selected to play in the 2010 Pro Bowl. He finished the 2009 season with 50 combined tackles (42 solo), five pass deflections, three interceptions, three forced fumbles, and a touchdown. Reed was the only player unanimously voted onto the AP 2008 NFL All-Pro team. In 2009, Reed was selected to the Sporting News's Team of the Decade (2000s). The Baltimore Ravens finished second in their division with a 9–7 record, but was eliminated after losing 20–3 at the Indianapolis Colts in the AFC Divisional Round. Reed recorded an interception in each of the Ravens' playoff games. Reed was named to the Pro Football Hall of Fame All-Decade Team for the 2000s. Reed underwent hip surgery during the offseason and was unable to physically participate in OTA's, training camp, and also missed the entire preseason. On September 4, 2010, the Baltimore Ravens placed Reed on their physically unable to perform list after it was determined that his recovery from hip surgery would take longer than originally expected. Head coach John Harbaugh named Tom Zbikowski during Reed's absence. On October 24, 2010, Reed made four solo tackles, two pass deflections, forced a fumble, and intercepted two passes by Bills' quarterback Ryan Fitzpatrick during a 37–34 win against the Buffalo Bills in Week 7. In Week 14, he collected a season-high seven combined tackles and broke up a pass in the Ravens' 34–28 win at the Houston Texans. On December 26, 2010, Reed recorded three combined tackles, made two pass deflections, and intercepted two passes by quarterback Colt McCoy during a 20–10 win at the Cleveland Browns in Week 16. The following week, he recorded two combined tackles, made a season-high three pass deflections, and intercepted two passes by Bengals'quarterback Carson Palmer during a 13–7 win against the Cincinnati Bengals. It became his third game of the season with multiple interceptions. On December 28, 2010, Reed was announced as a 2011 Pro Bowl selection. Reed completed the 2010 season with 37 combined tackles (30 solo), tied his career-high of 16 pass deflections, and led the league with eight interceptions in ten games and ten starts. He was ranked fifth by his fellow players on the NFL Top 100 Players of 2011. On January 18, 2011, the Baltimore Ravens promoted secondary coach Chuck Pagano to defensive coordinator after Greg Mattison accepted the defensive coordinator position at Michigan. Head coach John Harbaugh named Reed the starting free safety to begin the regular season, alongside strong safety Bernard Pollard and cornerbacks Chris Carr and Jimmy Smith. Pollard replaced Dawan Landry who started alongside Reed for the previous five seasons (2006–2010). Reed started in the Baltimore Ravens' season-opener against the Pittsburgh Steelers and recorded six solo tackles, a season-high four pass deflections, and intercepted two passes by quarterback Ben Roethlisberger in their 35–7 victory. Reed earned his 12th career game with multiple interceptions and surpassed former San Francisco 49ers' safety Ronnie Lott for most multi-interception games in a career. Lott had previously held the record with 11 games with multiple interceptions since 1993. The following week, he collected a season-high eight combined tackles during a 26–13 loss at the Tennessee Titans in Week 2. On December 27, 2011, it was announced that Reed was selected to the 2012 Pro Bowl. Reed started in all 16 games in 2011 nd recorded 52 combined tackles (44 solo), eight pass deflections, three interceptions, and a sack. The Baltimore Ravens finished atop the AFC North with a 12–4 record and clinched a playoff berth. On January 15, 2012, Reed recorded six solo tackles, deflected four passes, and intercepted a pass by quarterback T. J. Yates in the fourth quarter of the Ravens' 20–13 victory against the Houston Texans in the AFC Divisional Round Reed deflected another pass to seal the Ravens' victory, but was injured slightly. The following week, he made four combined tackles and two pass deflections as the Ravens lost 23-20 to the New England Patriots in the AFC Championship Game. He was ranked 16th by his fellow players on the NFL Top 100 Players of 2012. On January 27, 2012, Baltimore Ravens' head coach John Harbaugh promoted linebackers coach Dean Pees to defensive coordinator after Chuck Pagano accepted the head coaching position with the Indianapolis Colts. Pees retained Reed and Bernard Pollard as the starting safeties in 2012. Reed signing a football helmet in 2012. Reed skipped out on a mandatory minicamp, but returned for training camp. He started in the Baltimore Ravens' season-opener against the Cincinnati Bengals and made two solo tackles, deflected two passes, and returned an interception by Andy Dalton for a 34-yard touchdown on their 44–13 victory. His 34-yard interception return made him the NFL's all-time leader in career interception return yards. In Week 3, Reed collected a season-high nine combined tackles and broke up two passes during a 31–30 victory against the New England Patriots. On November 19, 2012, Reed was given a one-game suspension by the league "for repeated violations of the rule prohibiting hits to the head and neck area of defenseless players" following an unnecessary roughness call for a hit on wide receiver Emmanuel Sanders. Reed was considered a repeat offender based on his prior hits to wide receiver Deion Branch earlier in the season and to quarterback Drew Brees in 2010. The suspension was later overturned, and Reed was fined $50,000 for the hit. On December 26, 2012, it was announced that Reed was selected to the 2013 Pro Bowl. He started in all 16 games in 2012 and recorded 58 combined tackles (45 solo), 16 pass deflections, four interceptions, and a touchdown. Reed and his son at M&T Bank Stadium following the Ravens Super Bowl XLVII victory. The Baltimore Ravens finished atop the AFC North with a 10–6 record and earned a playoff berth. They reached Super Bowl XLVII after defeating the Indianapolis Colts 24–9 in the AFC Wild Card Game, the Denver Broncos 38–35 in the AFC Divisional Round, and also defeated the New England Patriots 28-13 in the AFC Championship Game. On February 3, 2013, Reed started in Super Bowl XLVII and recorded five solo tackles, deflected a pass, and intercepted a pass by 49ers' quarterback Colin Kaepernick in the Ravens' 34–31 victory against the San Francisco 49ers. He was ranked 18th by his fellow players on the NFL Top 100 Players of 2013. On January 24, 2013, Reed stated that despite repeated reports he might retire, he intended to play the next year. Reed became a free agent after his contract expired at the end of the 2012 season. While he had considered retiring after the 2012 season, Reed stated after the Super Bowl that he intended to continue playing football in 2013. Reed scored a total of 13 touchdowns in his career with the Baltimore Ravens. In addition, he recorded three blocked punts, one punt return, two fumble returns, and seven interception returns. On March 22, 2013, Reed signed a three-year contract worth $15 million with $5 million guaranteed with the Houston Texans. Later in the 2013 offseason, Reed underwent arthroscopic surgery in his hip to repair a small labral tear. Reed made his Houston Texans debut on September 22, 2013 against the Ravens in Baltimore. As the season progressed, Reed saw his playing time reduced. He eventually lost his starting job to Shiloh Keo during Week 9 against the Indianapolis Colts. On November 12, 2013, Reed was released by the Texans after displaying limited production with just 16 tackles, no interceptions, no forced fumbles, and no passes defended through seven games. Reed was signed by the New York Jets on November 14, 2013 after clearing waivers. The move reunited Reed with head coach Rex Ryan, whom he played for when Ryan was the defensive coordinator of the Baltimore Ravens. Reed played his first game as a Jet on November 17, 2013 against the Buffalo Bills. In Week 14, he recorded his first interception of the 2013 season against Oakland Raiders quarterback Matt McGloin. In Weeks 16 and 17, against the Cleveland Browns and Miami Dolphins respectively, Reed had an interception late in each game's fourth quarter, to preserve the Jets' win. The interceptions helped the Jets close the season with two straight wins to finish with an 8-8 record, which played a major part in Rex Ryan keeping his job as head coach. For the rest of the 2013 season, Reed played in seven games, of which he started five, with 22 tackles, four passes defended, and three interceptions. Overall, in 2013, combined with both teams he played for, Reed played 14 games, of which he started 10, with 42 total tackles, four passes defended, and three interceptions. After spending the entire 2014 year out of football, Reed announced his retirement on May 6, 2015. He signed a one-day contract with the Ravens and officially retired on May 7, 2015. On January 13, 2016, Reed was hired as an assistant defensive backs coach for the Buffalo Bills. This reunited him with coach Rex Ryan for the third time, after stints together with the Ravens and Jets during Reed's playing career. After serving the 2016 season in Buffalo, Reed was not retained by new coach Sean McDermott after Ryan's dismissal. ^ Wilson, Aaron (July 31, 2006). "Top free safety in the game". Scout.com. Archived from the original on October 18, 2007. Retrieved November 28, 2008. ^ Sando, Mike (October 7, 2007). "Five to fear: Manning, Brady, Moss, Smith, Gates". Sports.espn.go.com. Retrieved November 28, 2008. ^ Chadiha, Jeffri (August 30, 2005). "Top 10 players at the NFL's hottest defensive position". Sportsillustrated.cnn.com. Retrieved November 28, 2008. ^ Borges, Ron. "Belichick: Reed's a keeper". Boston Herald website. Retrieved November 28, 2008. ^ Powell, Camille (August 1, 2006). "Reed Is Determined To Outsmart Rivals". Washington Post website. Retrieved November 28, 2008. ^ Hensley, Jamison (July 6, 2005). "Spotlight on defensive backs". USA Today website. Retrieved November 28, 2008. ^ a b Valkenburg, Kevin Van. Ed Reed, hiding in plain sight. ESPN. January 29, 2013. Retrieved February 4, 2013. ^ a b c d e f g Player Bio: Edward Reed. hurricanesports.com. Retrieved February 4, 2013. ^ Walker, Childs. In Saint Rose, La., he's still small-town Edward Reed. Baltimore Sun. February 1, 2013. Retrieved February 4, 2013. ^ "Big East Championships - Mens Results". ^ a b "Baltimore Ravens " Players " Ed Reed". Baltimore Ravens Official website. Archived from the original on March 5, 2008. Retrieved November 30, 2008. ^ 2011 NCAA Football Records Book, Award Winners, National Collegiate Athletic Association, Indianapolis, Indiana, p. 11 (2011). Retrieved June 24, 2012. ^ Platania, Joe (September 27, 2007). "Ed Reed: The Ravens' Bird of Prey". Pressboxonline.com. Retrieved November 28, 2008. ^ Kim, Steve (August 22, 2006). "Miami All-2000s Team: Defense". Miami.scout.com. Archived from the original on December 2, 2008. Retrieved November 28, 2008. ^ "South Florida Sports Paradise: Happy Birthday Ed Reed". Miamisouthpaw.blogspot.com. September 11, 2007. Retrieved November 28, 2008. ^ "NFL football news, rumors, analysis". Pro Football Weekly. Archived from the original on November 21, 2008. ^ "UM Sports Hall of Fame Announces its Class of 2012 Inductees - HurricaneSports.com - The University of Miami Official Athletic Site". Hurricanesports.cstv.com. Archived from the original on December 28, 2011. Retrieved January 22, 2012. 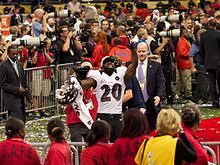 ^ "2018 College Football Hall of Fame Profile: Ed Reed". National Football Foundation. Retrieved February 27, 2019. ^ "Pro-Football-Reference: 2002 NFL Combine". National Football League. Retrieved August 28, 2018. ^ "2002 NFL Draft Listing". Pro-Football-Reference.com. Retrieved February 27, 2019. ^ NFL Draft History. NFL.com. Retrieved February 4, 2013. ^ "Spotrac.com: Ed Reed contract". spotrac.com. Retrieved August 28, 2018. ^ "Depleted Ravens Take Ed Reed With First Pick". hurricanesports.com. April 20, 2012. Retrieved August 28, 2018. ^ "Mitchell may be odd man out". articles.baltimoresun.com. August 27, 2002. Retrieved August 28, 2018. ^ "Week 1 NFL Injury Report (Sep. 4)". jt-sw.com. Retrieved August 28, 2018. ^ "Baltimore Ravens at Carolina Panthers - September 8th, 2002". Pro-Football-Reference.com. Retrieved February 27, 2019. ^ "Denver Broncos at Baltimore Ravens - September 30th, 2002". Pro-Football-Reference.com. Retrieved February 27, 2019. ^ "Broncos Dog It, Lose to Ravens". articles.latimes.com. October 1, 2002. Retrieved August 28, 2018. ^ a b "NFL Player stats: Ed Reed (2002)". NFL.com. Retrieved August 28, 2018. ^ "Baltimore Ravens at Indianapolis Colts - October 13th, 2002". Pro-Football-Reference.com. Retrieved February 27, 2019. ^ "Jacksonville Jaguars at Baltimore Ravens - October 20th, 2002". Pro-Football-Reference.com. Retrieved February 27, 2019. ^ "Reed won't let mistake bother him". washingtontimes.com. November 11, 2002. Retrieved August 28, 2018. 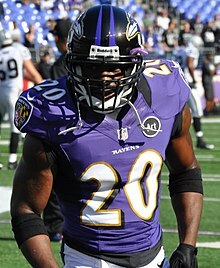 ^ a b c d e f g h i "NFL Player stats: Ed Reed (career)". NFL.com. Retrieved August 28, 2018. ^ "2002 NFL All-Rookie Team". Pro-Football-Reference.com. Retrieved February 27, 2019. ^ "Baltimore Ravens at Pittsburgh Steelers - September 7th, 2003". Pro-Football-Reference.com. Retrieved February 27, 2019. ^ a b "NFL Player stats: Ed Reed (2003)". NFL.com. Retrieved August 28, 2018. ^ "Cleveland Browns at Baltimore Ravens - September 14th, 2003". Pro-Football-Reference.com. Retrieved February 27, 2019. ^ "Baltimore Ravens at Arizona Cardinals - October 12th, 2003". pro-football-reference.com. Retrieved August 28, 2018. ^ "Baltimore Ravens at Seattle Seahawks -". pro-football-reference.com. Retrieved August 28, 2018. ^ "2003 NFL Pro Bowlers". Pro-Football-Reference.com. Retrieved February 27, 2019. ^ "2003 NFL Standings & Team Stats". Pro-Football-Reference.com. Retrieved February 27, 2019. ^ "Baltimore Ravens at Cincinnati Bengals - September 26th, 2004". Pro-Football-Reference.com. Retrieved February 27, 2019. ^ "Cleveland Browns at Baltimore Ravens - November 7th, 2004". Pro-Football-Reference.com. Retrieved February 27, 2019. ^ "Baltimore Ravens at New England Patriots - November 28th, 2004". Pro-Football-Reference.com. Retrieved February 27, 2019. ^ "NFL Player stats: Ed Reed (2004)". NFL.com. Retrieved August 28, 2018. ^ "2005 NFL Pro Bowl rosters". deseretnews.com. Retrieved August 28, 2018. ^ "2004 NFL All-Pros". Pro-Football-Reference.com. Retrieved February 27, 2019. ^ "AP Defensive Player of the Year Winners". Pro-Football-Reference.com. Retrieved February 27, 2019. ^ Reed's 106-yard interception return TD seals victory. ESPN. November 7, 2004. Retrieved February 4, 2013. ^ a b "Reed loses a yard, but interception return for TD still a record", AP at ESPN.com, November 26, 2008. ^ "Cleveland Browns at Baltimore Ravens - October 16th, 2005". Pro-Football-Reference.com. Retrieved February 27, 2019. ^ a b c Ed Reed NFL Football Statistics. Pro-Football-Reference.com. Retrieved February 4, 2013. ^ Clayton, John. Position's physical demands taking toll on players. ESPN. October 28, 2005. Retrieved February 4, 2013. ^ "Ed Reed 2005 Game Log". Pro-Football-Reference.com. Retrieved February 27, 2019. ^ "Ravens lock up safety Reed with six-year extension". ESPN.com. June 28, 2006. Retrieved August 28, 2018. ^ "San Diego Chargers at Baltimore Ravens - October 1st, 2006". Pro-Football-Reference.com. Retrieved February 27, 2019. ^ "Cincinnati Bengals at Baltimore Ravens - November 5th, 2006". Pro-Football-Reference.com. Retrieved February 27, 2019. ^ "Rolle-ing with the punches". washingtonexaminer.com. November 6, 2006. Retrieved August 28, 2018. ^ "NFL Player stats: Ed Reed (2006)". NFL.com. Retrieved August 28, 2018. ^ "Ourlads.com: Baltimore Ravens Depth Chart: 09/02/2007". Ourlads.com. Retrieved August 28, 2018. 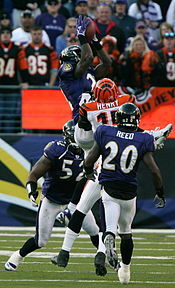 ^ "Baltimore Ravens at Cincinnati Bengals - September 10th, 2007". Pro-Football-Reference.com. Retrieved February 27, 2019. ^ "Bengals survive injury, turnover-laden romp with Ravens". ESPN.com. September 11, 2007. Retrieved August 28, 2018. ^ "NFL Player stats: Ed Reed (2007)". NFL.com. Retrieved August 28, 2018. ^ "2008 Pro Bowl Roster". NFL.com. December 18, 2008. Retrieved August 28, 2018. ^ "Billick, entire Ravens coaching staff dismissed following 5-11 season". ESPN.com. December 31, 2007. Retrieved August 28, 2018. ^ "2007 Baltimore Ravens Starters, Roster, & Players". Pro-Football-Reference.com. Retrieved February 27, 2019. ^ "Cleveland Browns at Baltimore Ravens - September 21st, 2008". Pro-Football-Reference.com. Retrieved February 27, 2019. ^ "Philadelphia Eagles at Baltimore Ravens - November 23rd, 2008". Pro-Football-Reference.com. Retrieved February 27, 2019. ^ a b c d "Ed Reed: A rare safety, and Baltimore' gamebreaker". International Herald Tribune website. Associated Press. November 26, 2008. Retrieved November 30, 2008. ^ "Reed rumbles 108 yards for NFL record". Pro Football Hall of Fame website. November 24, 2008. Retrieved November 30, 2008. ^ "Jersey and football from Ed Reed's record interception return". Pro Football Hall of Fame website. November 26, 2008. Retrieved November 30, 2008. ^ "Pittsburgh Steelers at Baltimore Ravens - December 14th, 2008". Pro-Football-Reference.com. Retrieved February 27, 2019. ^ "Your 2009 Pro Bowl Roster". deadspin.com. December 16, 2008. Retrieved August 29, 2018. ^ a b "NFL Player stats: Ed Reed (2008)". NFL.com. Retrieved August 29, 2018. ^ "Jacksonville Jaguars @ Baltimore Ravens: Game Summary (2008)". ESPN.com. Retrieved August 29, 2018. ^ "2008 NFL Standings & Team Stats". Pro-Football-Reference.com. Retrieved February 27, 2019. ^ "Wild Card - Baltimore Ravens at Miami Dolphins - January 4th, 2009". Pro-Football-Reference.com. Retrieved February 27, 2019. ^ Pennington throws four interceptions in loss. ESPN. January 4, 2009. Retrieved February 4, 2013. ^ "AFC Championship - Baltimore Ravens at Pittsburgh Steelers - January 18th, 2009". Pro-Football-Reference.com. Retrieved February 27, 2019. ^ "Mattison to keep Ravens' pressure D". ESPN.com. January 26, 2009. Retrieved August 29, 2018. ^ "Ourlads.com: Baltimore Ravens Depth Chart: 09/06/2009". Ourlads.com. Retrieved August 29, 2018. ^ "Cincinnati Bengals at Baltimore Ravens - October 11th, 2009". Pro-Football-Reference.com. Retrieved February 27, 2019. ^ "NFL Game Center: Week 5-2008: Cincinnati Bengals @ Baltimore Ravens". NFL.com. Retrieved August 29, 2018. ^ "Ravens' Reed doubtful with groin injury". ESPN.com. December 25, 2009. Retrieved August 29, 2018. ^ "2010 Pro Bowl Roster". NFL.com. December 29, 2009. Retrieved August 29, 2018. ^ "Ravens safety Reed is only unanimous selection to All-Pro team". NFL.com. January 9, 2009. Retrieved December 24, 2010. ^ Sporting News names its athletes, teams of the decade; LeBron James makes the cut. Cleveland.com. September 25, 2009. Retrieved February 4, 2013. ^ "2009 NFL Standings & Team Stats". Pro-Football-Reference.com. Retrieved February 27, 2019. ^ "Divisional Round - Baltimore Ravens at Indianapolis Colts - January 16th, 2010". Pro-Football-Reference.com. Retrieved February 27, 2019. ^ "NFL Player stats: Ed Reed (2009)". NFL.com. Retrieved August 29, 2018. ^ "Pro Football Hall of Fame All-Decade Teams - 2000s". Pro-Football-Reference.com. Retrieved February 27, 2019. ^ Associated Press (September 4, 2010). "Ravens' Ed Reed begins year on PUP list". ESPN.com. Retrieved August 29, 2018. ^ "Ourlads.com: Baltimore Ravens Depth Chart: 09/05/2010". Ourlads.com. Retrieved August 29, 2018. ^ "NFL Game Center: Week 7-2010: Buffalo Bills @ Baltimore Ravens". NFL.com. Retrieved August 29, 2018. ^ "Baltimore Ravens at Houston Texans - December 13th, 2010". Pro-Football-Reference.com. Retrieved February 27, 2019. ^ "NFL Game Center: Week 16-2010: Baltimore Ravens @ Cleveland Browns". NFL.com. Retrieved August 29, 2018. ^ "NFL Game Center: Week 17-2010: Cincinnati Bengals @ Baltimore Ravens". NFL.com. Retrieved August 29, 2018. ^ "2011 Pro Bowl Roster". NFL.com. December 28, 2010. Retrieved August 29, 2018. ^ La Canfora, Jason. Ravens will place six-time Pro Bowl safety Reed on PUP list. NFL.com. September 3, 2010. Retrieved February 4, 2013. ^ "2011 NFL Top 100". Pro-Football-Reference.com. Retrieved February 27, 2019. ^ "Ravens hire Chuck Pagano". 247sports.com. January 18, 2011. Retrieved August 29, 2018. ^ "Ravens 2011 depth chart". baltimoresportsreport.com. September 6, 2011. Retrieved August 29, 2018. ^ "NFL Player stats: Ed Reed (2011)". NFL.com. Retrieved August 29, 2018. ^ Cole, Jason. "Reed is the greatest NFL thief of all time". Retrieved September 15, 2011. ^ "2012 Pro Bowl Rosters". NFL.com. December 27, 2011. Retrieved August 29, 2018. ^ "2011 NFL Standings & Team Stats". Pro-Football-Reference.com. Retrieved February 27, 2019. ^ Ravens' Ed Reed hobbled but eager for AFC title game The Sporting News Retrieved October 29, 2012. ^ Hensley, Jamison. No serious damage to Ed Reed's ankle. ESPN. January 17, 2012. Retrieved February 4, 2013. ^ "'Top 100 players of 2012': Ed Reed". NFL.com. Retrieved February 27, 2019. ^ "Pees takes over as Ravens defensive coordinator". NFL.com. January 27, 2012. Retrieved August 29, 2018. ^ "Ourlads.com: Baltimore Ravens Depth Chart: 09/01/2012". Ourlads.com. Retrieved August 29, 2018. ^ Ed Reed reports to Ravens training camp Jeff Zrebiec, Baltimore Sun Retrieved October 29, 2012. ^ Ed Reed skips first day of camp Jamison Hensley, ESPN Retrieved October 29, 2012. ^ "Cincinnati Bengals at Baltimore Ravens - September 10th, 2012". Pro-Football-Reference.com. Retrieved February 27, 2019. ^ Ed Reed takes interception to the house, record books Gregg Rosenthal, NFL.com Retrieved October 29, 2012. ^ "New England Patriots at Baltimore Ravens - September 23rd, 2012". Pro-Football-Reference.com. Retrieved February 27, 2019. ^ "2013 Pro Bowl Roster". ESPN.com. December 26, 2012. Retrieved August 29, 2018. ^ "2012 NFL Standings & Team Stats". Pro-Football-Reference.com. Retrieved February 27, 2019. ^ "Wild Card - Indianapolis Colts at Baltimore Ravens - January 6th, 2013". Pro-Football-Reference.com. Retrieved February 27, 2019. ^ "Divisional Round - Baltimore Ravens at Denver Broncos - January 12th, 2013". Pro-Football-Reference.com. Retrieved February 27, 2019. ^ "AFC Championship - Baltimore Ravens at New England Patriots - January 20th, 2013". Pro-Football-Reference.com. Retrieved February 27, 2019. ^ "NFL Player stats: Ed Reed (2012)". NFL.com. Retrieved August 29, 2018. ^ "'Top 100 Players of 2013': Ed Reed". NFL.com. Retrieved February 27, 2019. ^ Jeff Zrebiec, Ravens safety Ed Reed not planning to retire after season. The Baltimore Sun, January 24, 2013. ^ a b Wilson, Aaron. John Harbaugh says Ravens want to bring back Ed Reed. Baltimore Sun. February 5, 2013. Retrieved February 6, 2013. ^ Hanzus, Dan. Ed Reed plans to sign contract with Houston Texans. NFL.com. March 20, 2013. Retrieved March 21, 2013. ^ Wesseling, Chris. Ed Reed reportedly had arthroscopic hip surgery. NFL.com. May 3, 2013. Retrieved October 25, 2013. ^ Vensel, Matt. Ed Reed makes his Houston Texans debut in return to Baltimore Archived October 29, 2013, at the Wayback Machine. Baltimore Sun. September 22, 2013. Retrieved October 25, 2013. ^ Rosenthal, Gregg.Ed Reed demoted from Houston Texans' lineup. NFL.com. November 7, 2013. Retrieved November 8, 2013. ^ "Texans release Reed, put Foster on IR". ESPN.com. November 12, 2013. Retrieved February 27, 2019. ^ a b Woo, Stu (November 14, 2013). "Jets Add Wisdom to Secondary". Wall Street Journal. Archived from the original on November 15, 2013. Retrieved November 15, 2013. ^ "New York Jets at Buffalo Bills - November 17th, 2013". Pro-Football-Reference.com. Retrieved February 27, 2019. ^ "Jets safety Ed Reed gets first interception, victory of season against Raiders". nj.com. Retrieved December 8, 2013. ^ "Cleveland Browns at New York Jets - December 22nd, 2013". Pro-Football-Reference.com. Retrieved February 27, 2019. ^ "New York Jets at Miami Dolphins - December 29th, 2013". Pro-Football-Reference.com. Retrieved February 27, 2019. ^ "Rex Ryan, Jets agree to multiyear contract extension". ^ "Ed Reed 2013 Game Log". Pro-Football-Reference.com. Retrieved February 27, 2019. ^ Wesseling, Chris. "Reed announces retirement". NFL.com. NFL.com. Retrieved May 6, 2015. ^ "NFL Interceptions Career Playoffs Leaders". Pro-Football-Reference.com. Retrieved February 27, 2019. ^ "Raven Reed's INT return adjusted to 107 yards". ESPN.com. November 26, 2008. Retrieved February 27, 2019. ^ Walker, Childs. "Ed Reed becomes third homegrown Raven selected for Pro Football Hall of Fame". baltimoresun.com. Retrieved February 27, 2019. ^ "Ed Reed's career by the numbers". ESPN.com. May 7, 2015. Retrieved February 27, 2019. ^ "Ravens' Reed expected to play, not retire, after hip surgery". nfl.com. May 5, 2010. Retrieved September 5, 2010. ^ "Ravens Legend Ed Reed". www.baltimoreravens.com. Retrieved February 27, 2019. ^ a b "Baltimore Ravens Career Defense Leaders - Pro-Football-Reference.com". Pro-Football-Reference.com. ^ Smith, Michael (January 13, 2016). "Rex hires Ed Reed as Bills' assistant defensive backs coach". NBCSports.com. Retrieved April 2, 2016. ^ Zrebiec, Jeff. "Ed Reed won't return for second season on Bills' coaching staff". baltimoresun.com. Retrieved July 10, 2017. Wikimedia Commons has media related to Ed Reed.